I’m not sure this is a happy painting but I must admit I am happy with her. This is my most recent painting and I can see that I am getting better at portrait painting. The human face is complex, the shapes and forms have to blend together well to work. My husband, who is an architectural illustrator can easily sketch out the human figure. He is much more visual than I am. I realize that feeling and playing with color is my strong suit. I love the fact that the more I paint the better I am becoming at really seeing, this keeps me inspired. 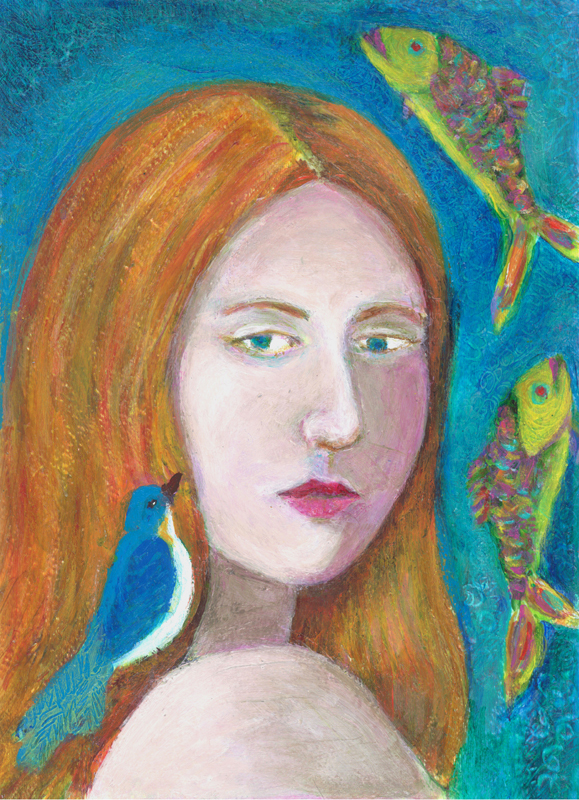 Here I’ve tried to paint a centered, strong willed woman who is in touch with her feelings (fish) and listens to her intellect (bird).